This Wash Wash Rinse System was built for precision cleaning of remanufactured transmission valve bodies prior to reassembly. It processes a complete family of AUTOMATIC TRANSMISSION COMPONENTS and achieves very high cleanliness specifications in accordance with the manufacturers requirements. The line is constructed from the MKT24 Series and runs left to right. Constructed from the MKT24 Series and runs left to right (front of the system). The photo above shows the front of the system. The electrical panels including timers and temperature controllers are mounted to the rear with front mounted push button operator controls. The photo below shows the rear of the system with oil removal, filtration and ultrasonic generator pedestals. Note that nothing is placed underneath processing tanks or tucked behind “access” panels. All valves, pumps, filters, cylinders and heaters are located outside of the console where they are accessible, clearly visible for inspection and easily serviced. RAMCO systems are designed for industrial applications. MKT24 rear of the system w/ oil removal, filtration and ultrasonic generator pedestals. Each stage includes roller conveyor sections for easy transfer between stages (see below). Roller conveyors are built for supporting the workload while allowing maximum transmission of mechanical energy within each working zone. Each stage includes roller conveyor sections for easy transfer between stages. Precision Washes – The first two stages are designed to wash off oil, grease, dirt, oxidation and carbon deposits from the valve bodies with an alkaline detergent in two heated immersion baths. 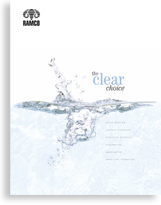 Due to the critical cleaning requirements of the process ultrasonics, vertical platform oscillation and solution turbulation/filtration were used in both washing chambers. 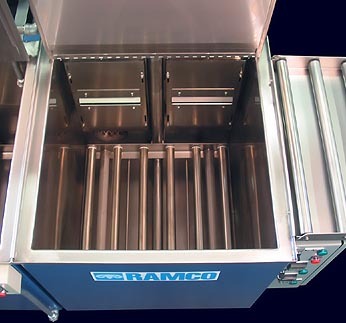 The unique RAMCO ultrasonic system uses powerful sweep frequency ultrasonics in conjunction with turbo/filter/agitation washing. Using mechanical agitation washing to remove gross contamination and ultrasonic cleaning to remove finer and/or more resistive deposits is a very effective processing routine. 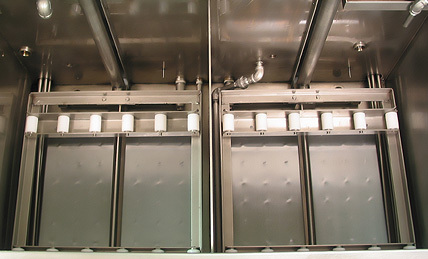 The steps are sequenced with dual digital cascading timers for agitation washing before (or after) the ultrasonic cleaning phase and MultipleRollover to repeat the dual mode process for a preset number of “rollovers”. The results are faster cleaning and more effective processing. The ultrasonic stage can be set to provide vertical oscillation of the work during the cycle. A selector switch is provided for static ultrasonic or oscillating ultrasonic modes. 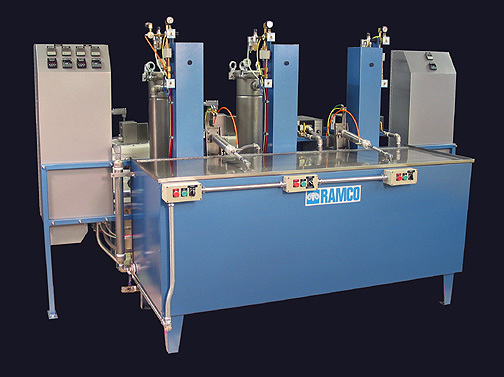 RAMCO precision washing systems provides superior ultrasonic washing action over conventional systems by moving the work through the peaks and nodes of the wave energy. 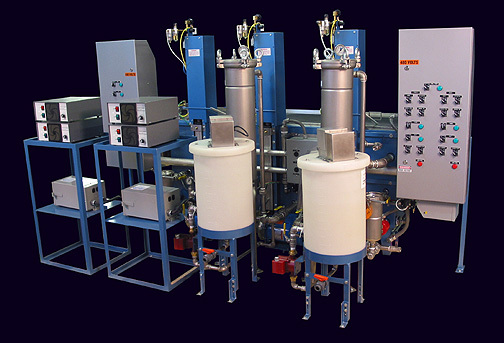 Rinsing – The heated rinse uses platform oscillation with turbo/filter/agitation to provide a thorough rinsing of the parts. The elevator moves the basket into the working zone and oscillates the parts in solution with either a short or long stroke. A selector switched is used to select either long 5 to 9 inch or short 2 to 4 inch strokes. The long stroke is used to provide better flushing (hydraulically forcing solution though the working zone) for nested masses of parts and/or complex shapes with recessed passages whereas the short stroke is used to provide quicker oscillations and faster cleaning of simple parts and/or part configurations. Flexibility in stroke ranges and speeds produces more comprehensive cleaning (see Dynamic Flow Combination). Drying – An optional Hot Air Knife Dryer is available (see below). 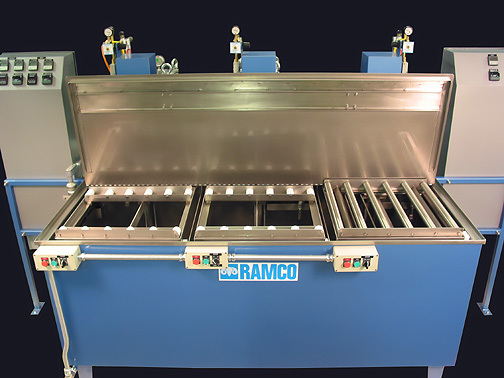 RAMCO Hot Air Knife Blow-Off Dryers are proven for rapidly drying parts. The key to the process is the process elevator. It is used to produce changing flow patterns that result in dynamic drying (i.e. platform oscillation combined with hot air flow). The effect of “dynamic flow combination” is better coverage of component surfaces, maximum evaporation and accelerated processing times.